Mom Knows Best : Holiday Hangover $50 AMEX Gift Card Giveaway Event! 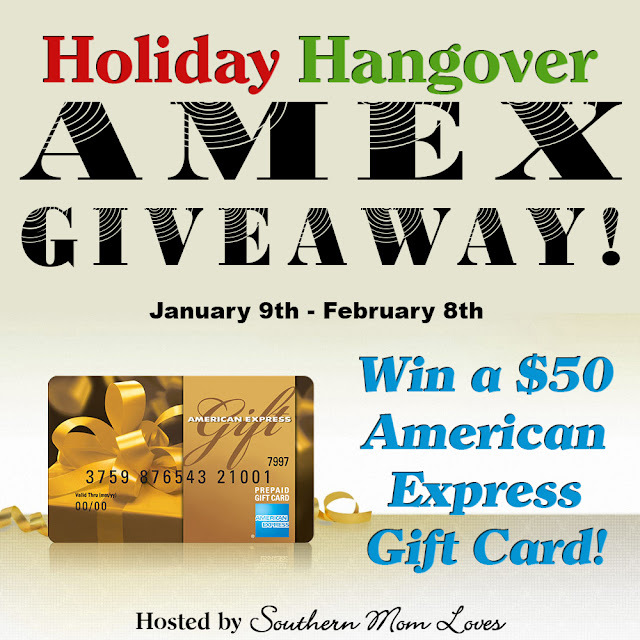 Holiday Hangover $50 AMEX Gift Card Giveaway Event! Money is always a great prize to win. I love entering to win money giveaways! I would spend it on some new clothes. I would spend it partly on some new makeup and partly on some new dog toys for my fur baby! I would put this towards household items like, groceries, cleaning products, or gas, since my husband and I are both out of work at the moment. I would spend it on a microwave cart for my daughter's kitchen since she doesn't having any counter space to cook. FYI - The Vote at Picket Fence entry is not working. When you click on the link, I get a 502 Bad Gateway message. I would love to win this awesome gift card and spend it on the new stroller for my little one! If I win the $50 AMEX gift card, I will probably spend it on a fun activity to do with my three kids. If I won, I might stock up on meat on sale. I like to buy large packages of meat on sale. I break them up into meal size packages for our family. It is a great way to save money. I am going to use the AMEX gift card to pay some bills. I would spend this on a new blender that we need so badly. will go in the gas tank. times are tough, E comes around too quickly! So many options! I would probably spend it on some new work clothes. I will spend it on a new pair of workout shoes. I would buy some new cd's and Cheryl's cookies. Dog treats! Those puppies are expensive! I need some more clothes for work, so I think I'd spend it on those! I have my Husbands 50th birthday party in May that I'm saving up for and any extra money would help with his weekend getaway with family. I would spend it on a new printer. Ours broke a while back and I so miss creating and finding printable for my kid's activities. Thanks! I'd spend it on new gym clothes! This is so awesome. If I were to win I would probably use this towards a college book that I will be needing for Summer classes! I would use it toward a new coat for winter if I won. I would love to buy myself a new outfit, but it will probably be spent on food or hygiene products. I would use it toward everyday expenses and put an extra $50 from my paycheck into savings. I would use the GC for gasoline (even though you have to go inside to use these Amex GC) for a road trip my sister and I have planned to go to Savannah, GA. I actually have my eyes on a really nice end table from Amazon and I would use it on that as the table is $48. To be honest, I just moved into my own apartment so I would probably use the gift card to buy groceries! Just purchased a house and I need a lot of stuff to decorate the new house with. I think I might buy some lights for the patio, since spring is on the way. I'd likely use the gift card towards groceries! I'd probably use it for groceries, or maybe some new bath products! I really need a new pair of supportive cross training sneakers...I'm also thinking about investing in a Ninja kitchen appliance.